The solution is based on a concept where a liquid alginate layer is applied to the sausage mass and then hardened into a firm structure in a calcium bath. The result is a strong and edible casing that gives sausages a crisp bite. This casing also offers processing advantages and there are no concerns about availability, the company writes. “The stabilizing system is based on a complex mix of highly reactive hydrocolloids and starch. Synergistic effects upon exposure to a calcium chloride solution lead to the formation of a casing with good elasticity and tensile strength,” explains Florian Bark, Hydrosol Product Manager. 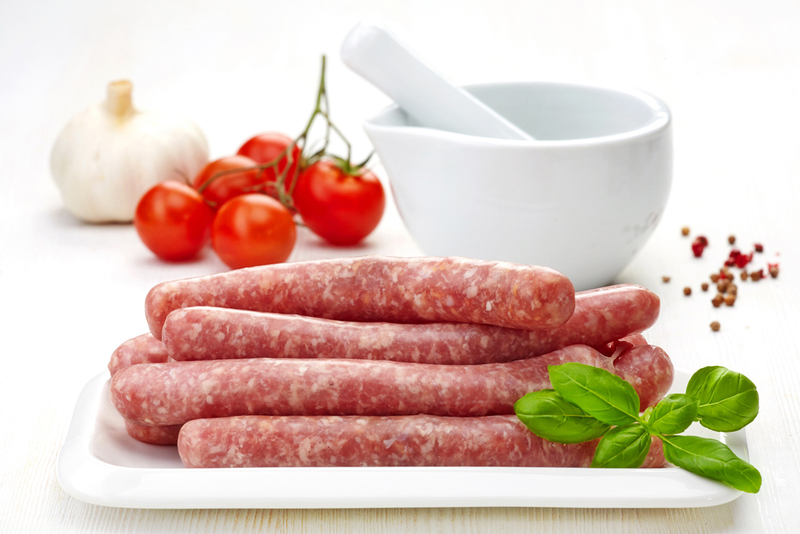 Click to EnlargeSmartCasings are suitable for fresh bratwurst, raw sausage and scalded sausage. 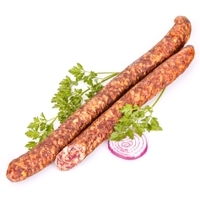 They are highly tear-resistant, and with raw sausages in particular they give a pleasantly soft bite.SmartCasings are suitable for fresh bratwurst, raw sausage and scalded sausage. They are highly tear-resistant, and with raw sausages in particular they give a pleasantly soft bite, as Bark reports. “Scalded sausages are a special challenge, as they are exposed to damp heat both during manufacture and later during preparation. So the casing needs to be not just tear-resistant, but also adhere to the sausage mass after cooking. To make sure it does, the sausages are cooked not by hanging in steam, but instead in a water bath using a special technique,” he notes. For best results, the casing and sausage mass should be well adapted to each other. This is true for all product categories, but especially for scalded sausage. “Here, our long experience in stabilizing sausages is a great benefit, as in addition to the casing we can always offer the right stabilization for the sausage mass. We take into account the specific phosphate content, salt content and viscosity of the mass. Thus, we offer the entire package for sausage-making, inside and out,” says Bark. SmartCasings are claimed to offer many advantages over conventional sausage casings. They permit a continuous manufacturing process, which results in low production costs. With SmartCasings there is no wastage or rework from intestine changes. Alginate cases also enable higher hourly throughput than is possible with conventional filling technology. The highly automated production technique requires less manual intervention and so has lower personnel costs. Furthermore, unlike cellulose casings there is no peeling step. There are also savings in material costs, as alginate casings are substantially more economical than natural intestine, collagen and cellulose casings, the company writes. Hydrosol SmartCasings also have another advantage – they are supplied as a powder. This gives them a much longer shelf-life than finished pastes, rendering preservatives superfluous. Transportation and storage costs are also much lower with powder than with pastes. The SmartCasing powder can be made into a paste at any time. Hydrosol currently offers two powder versions, SmartCasing M as the standard version with animal protein and SmartCasing VR for vegetarian and vegan sausages. Hydrosol SmartCasings are available in halal and kosher versions. Headquartered in Ahrensburg near Hamburg, Germany, Hydrosol is a fast-growing international supplier of food stabilizers, with subsidiaries around the world. Its specialists develop and produce tailor-made stabilizer systems for dairy products, ice cream and desserts, delicatessen and ready meals, as well as meat, sausage and fish products. The company also supplies solutions for beverages, and for vegetarian and vegan alternatives to meat and dairy products. Development in plant-based and often vegan alternatives is becoming increasingly important for the company, which is a subsidiary of the Stern-Wywiol Gruppe. In an exclusive and detailed interview, Hydrosol Managing Director, Matthias Moser recently explained the evolution of the company and business strategies moving forward, including innovation within the alternative proteins space. “Vegan alternatives to meat and dairy will remain very important. Trend researchers and current market figures confirm this. Meat and dairy alternative products will become increasingly standard, around the globe,” says Moser. “So vegan nutrition is by no means just a fad – especially as thanks to intelligent stabilizing and texturing systems, newer vegan alternatives to meat and dairy products are almost entirely equal to animal products in flavor and texture,” he notes.